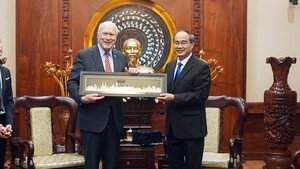 On December 3, Le Thanh Hai, secretary of the Party Committee of Ho Chi Minh City and Le Hoang Quan, chairman of the HCMC People’s Committee received a delegation of senior officials from Laos, led by Soukan Mahalath, secretary of the Lao People’s Revolutionary Party Central Committee and Mayor of Vientiane, to Ho Chi Minh City. On the occasion, Le Thanh Hai congratulated the delegation on the 37th anniversary of the National Day of Lao, and expressed appreciation on the achievements of the People's Revolutionary Party and Lao tribal people, especially the Laos admission to the World Trade Organization (WTO) and for successfully organizing the 9th Asia-Europe meeting (ASEM). Mr. Hai hosted a reception for Soukan Mahalath and his entourage from Vientiane. At the reception, leaders of the two cities expressed their delight at the strong development in all aspects in the two cities in particular and the two countries in general. On this occasion, the Lao delegation awarded HCMC officials medals for promoting Vietnam-Laos friendship. 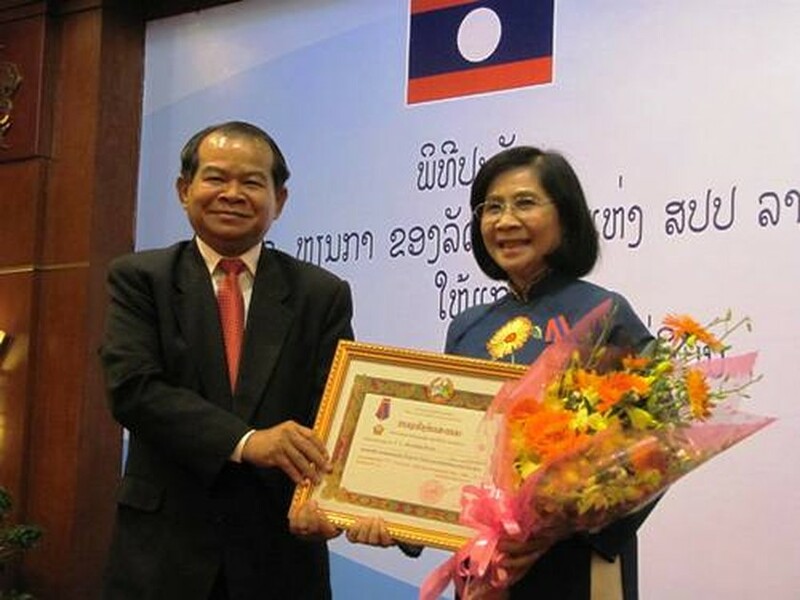 Nguyen Thi Thu Ha, Deputy Party Secretary received the Lao State's Isala Medal, second class; Hua Ngoc Thuan, Vice Chairman of HCMC received the Medal of Labor, second class; Truong Thi Anh, Deputy Chairman of the City Council, received the Medal of Friendship; Nguyen Thanh Tai, former Vice Chairman of HCMC People's Committee received the Labor Medal, second-class. Speaking at the ceremony, Nguyen Thi Thu Ha, Vice Secretary of Ho Chi Minh City Party Committee, said on behalf of two collectives and six individuals in the city who were awarded with orders and medals by the Lao State, the City will do its utmost to promote traditional friendship and comprehensive cooperation with Laos, including Vientiane. Soukan Mahalath stressed that the Party, Government and the people of Laos must always bear in mind the contributions of Vietnamese comrades to Laos’ revolution, both in the struggle for national independence and the current national reconstruction.